A traditional Scottish wedding isn't complete until the wedding dress is selected. Historical attire for a Scottish bride might include the clan tartan plaid, striped or a Victorian white wedding gown. The original Scottish wedding dress is called an "Arisaid." It resembles a sort of hooded cape that is tied at the waist. In the days of old Scotland, women only wore pale tartans or simple stripes, while the colorful clan tartans, or plaids, were reserved for the men. Women who dared to don tartans were considered harlots and treated as such. Today, if you choose to adopt this very traditional clothing for your marriage ceremony, you may wear any colors you choose without fear of being run out of town. It's your wedding, after all. However, you may want to do some historical research if you don't know what your clan colors or those of your groom's clan are. You wouldn't want to offend anyone who takes their clan colors seriously by selecting an inappropriate tartan. You can buy one online through Misty Thicket in the U.S., or you can buy any item of Scottish clothing in any tartan pattern online from Scot Web in Scotland. If you live in the U.S. or Canada, check the exchange rates before committing to an international purchase, or you may be in for a budget-busting shock, depending on the current state of the economy. Today's Scottish bride usually wears a long, white wedding gown similar to those worn throughout Europe and the U.S. There are a couple of differences in that these traditional Scottish wedding dresses tend to have more modest décolletage than those that many U.S. brides now wear, often with sleeves. This may be due to a difference in cultures, or it may be due to the chilly Scotland air, or both. 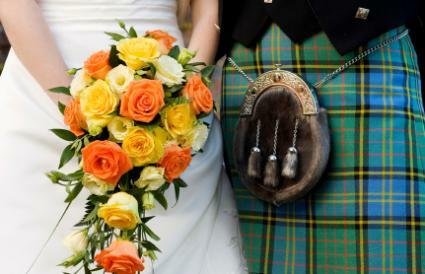 Scottish brides also tend to wear shorter trains than their U.S. counterparts, and no veils. Perhaps the most beautiful and memorable Scottish wedding gown is that which combines the best of old and new traditions. One of the prettiest styles is that in which the bride wears a tartan corset over her white wedding gown. In similar fashion, some Scottish brides wear tartan capes or tartan trains attached to the shoulders of their white gowns with beautiful jeweled brooches, or pins. Another option is to wear a white dress with a tartan hair bow, or a wide plaid ribbon tied at your waist. Add tartan ribbon sashes to your bridesmaids' dresses to complete the Scottish theme. It is traditional for Scottish grooms to wear kilts, but the newer western tradition of suits or tuxedos for men is common now. If your groom is up for the challenge, your guests will certainly be charmed to see him and his groomsmen in kilts, and your wedding photos are sure to be more colorful than if the men had worn dark suits. Even if your groom chooses a suit, you can consider enhancing your Scottish wedding theme with plaid vests and neck ties. Imagine yourself blissfully walking down the aisle wearing the white wedding dress that you always dreamed of, with a beautiful plaid train or cape falling from your back and a gold necklace at your throat with brilliant, dark gems to match your tartan plaid, with your husband waiting at the altar in his matching tartan attire. Your friends and relatives will talk about your beautiful Scottish wedding with awe for years, for that a one-of-a kind fairy tale wedding that you've always wanted.